Alexander County Schools will participate in a scheduled tornado drill on Tuesday, March 5 at 8:30 AM. 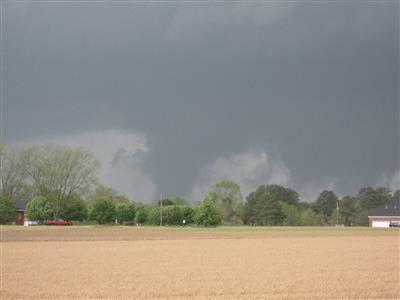 For more information regarding Severe Weather Week click the title. 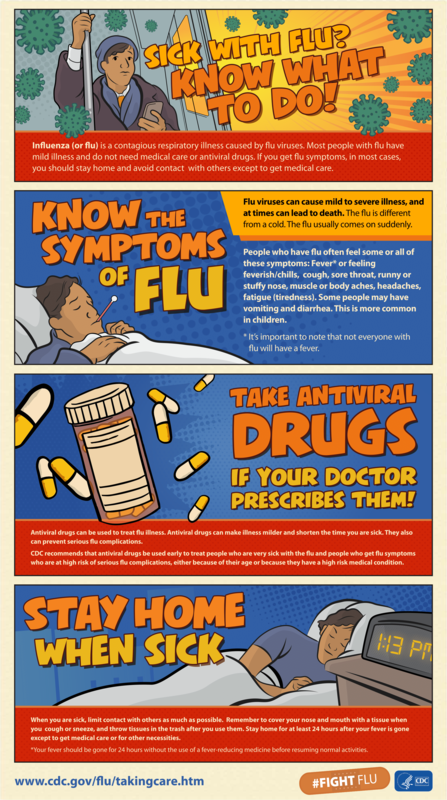 Help keep your school and community healthy! This link takes you to the academic calendar page. Congratulations to Cindy Thomas Sellers! She has been appointed to fill the vacant school board seat. You can watch the interviews and special called board meeting by clicking the heading above. Watch the special called meeting at 6 p.m.
Click the title to view the school board meeting live. Tonight's special called meeting is to interview candidates for the vacant school board seat. Alexander Central High School Baseball Coach Pete Hardee has been recognized by his peers for one of the most prestigious honors a coach can receive. Coach Hardee was inducted in the North Carolina Baseball Coaches Association Hall of Fame during the 2018 Coaches Convention held in Greensboro Friday, Dec. 7. Hardee joined the ACHS coaching staff in 2015 and has led Varsity Cougar Baseball for the past three seasons. Last spring, Hardee picked up his 400th career win in a Cougar victory ... to read more click the heading. 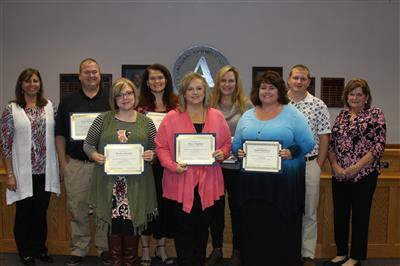 Alexander County School Board members and administration recognized 10 certified staff members who completed National Board Certification during the February school board meeting. Three staff members from Alexander County Schools obtained certification for the first time. They include Amber Huffman (Alexander Central High School), Kerri Wimberly (Alexander Central High School), and Christina (Crissy) Williams (Bethlehem Elementary School). Seven staff members were also honored that have renewed their national certification. They include Elizabeth Duncan (Alexander Central High School), Jeanette Badertscher (Bethlehem Elementary School), Erin Lewis (Ellendale Elementary School), Laura Sprinkle (Ellendale Elementary School), Jenna Buff (Sugar Loaf Elementary School), Cindy Greene (Sugar Loaf Elementary School), and Kim Lowman (West Alexander Middle School). To read more click the heading. Celebrate Love the Bus Week! 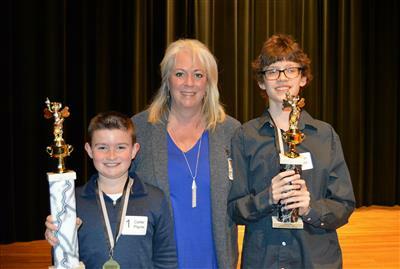 Eighteen students representing Alexander County’s elementary and middle schools took the stage at Alexander Central Auditorium Tuesday, Feb. 5, to compete for the top honor of Spelling Bee Champion. A fourth-grade student at Bethlehem Elementary School, Carter Payne, emerged as the 2019 Alexander County Spelling Bee Champion for the second time in a row. Noah Pope, an eighth-grade student from West Alexander Middle School, placed second in the countywide event. To read more and link to the photos, click the heading above. Congratulations to our first and second place winners in the #GeoBee2019! Michael Brown is the first place winner (for the second year in a row). Jacob White is our second place winner. To see more photos, click on the heading above. The latest update on the status of WAMS students from the accident is below. As reported yesterday all but two students were released by our last report yesterday. One was released late yesterday evening. The one remaining student's update is below. The student hospitalized following the bus accident yesterday at Baptist is recovering well, receiving care, and remains in stable condition. Preliminary reports from the parent indicate the student will be going home within the next few days. Please keep the student and all those involved in the accident in your continued thoughts and prayers. **Message from Alexander County Schools Thank you to our emergency workers, law enforcement, school personnel, community, and everyone who played a role in helping our students and bus driver in the bus accident yesterday. We are grateful for our community and your continued support. Alexander County School Bus Accident Update 4:30 p.m.
West Alexander Middle School bus 159 overturned this morning around 7:30 a.m. near Icard Ridge Road and Bulldog Lane. A second vehicle was involved in the accident, and it has been reported that the driver has been charged with a DWI. Nineteen students were on the bus; thirteen were transported to area hospitals as well as the bus driver. All students, except two, have been released from the hospitals. The two students who were later transported to Brenner Children’s Hospital in Winston-Salem are in stable condition. West Alexander Middle School bus 159 overturned this morning around 7:30 a.m. near Icard Ridge Road and Bulldog Lane. A second vehicle was involved in the accident. Nineteen students were on the bus; thirteen were transported to area hospitals as well as the bus driver. The school has contacted parents of students on the bus, and a call was sent to all parents via the parent notification system. 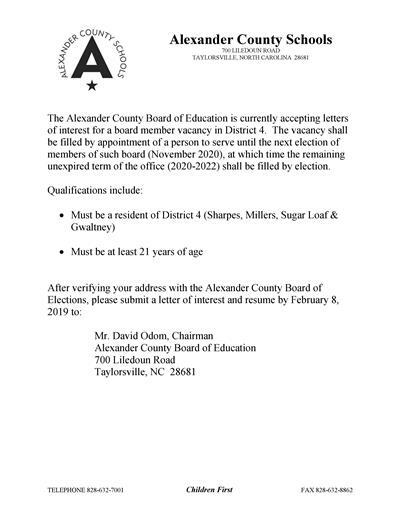 The Alexander County Board of Education is currently accepting letters of interest for a board member vacancy in District 4. The vacancy shall be filled by appointment of a person to serve until the next election of members of such board (November 2020), at which time the remaining unexpired term of the office (2020-2022) shall be filled by election. Click the heading to see the full listing. Due to below freezing temperatures this evening, Alexander County Schools will be operating on a three-hour delay on Thursday, December 13, with limited bus routes. Staff are to report at 10:00 AM. As we have traveled roads throughout the county this afternoon, some dirt roads are still questionable for bus travel. If you live on one of these roads, your bus may be stopping at a main paved road off of your road. If you live in a cul-de-sac where a bus turns around, make sure vehicles and tractors are out of the path of the bus. Please be patient with the bus driver as they may need extra time and community support to transport our children to school safety. 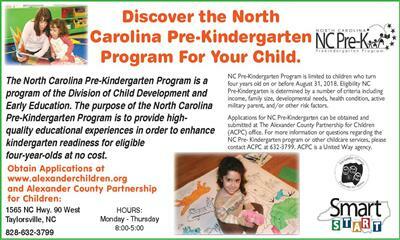 We are glad to be partners with our parents in taking care of all of Alexander County's children. Thank you for your support. 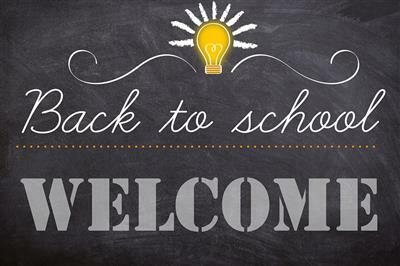 We look forward to seeing our students tomorrow. Eighth-grade students from West Alexander Middle School participated in Alexander County’s first student STEM Tour on November 20, 2018. The students were divided into groups and assigned to visit two of the four participating businesses. Our appreciation is extended to Hancock and Moore, Leonard’s Express, Ole Still Golf Club and Anchor-Richey EVS for allowing our students the opportunity to learn about various careers available, the necessary education needed for employment and possible salary ranges. To read more or see more tour photos click on the title above. 'Tis the season to show off your artistic talents! Alexander County Schools is seeking students in grades Pre-K through 12th to design an official Alexander County Schools Holiday Card. Coming soon - the 2018 Designs! 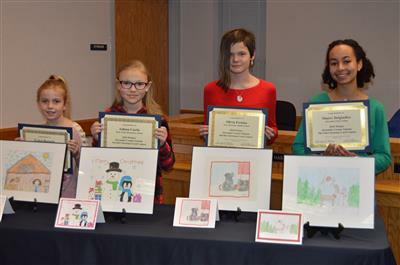 A committee will vote on the artwork provided by the students. 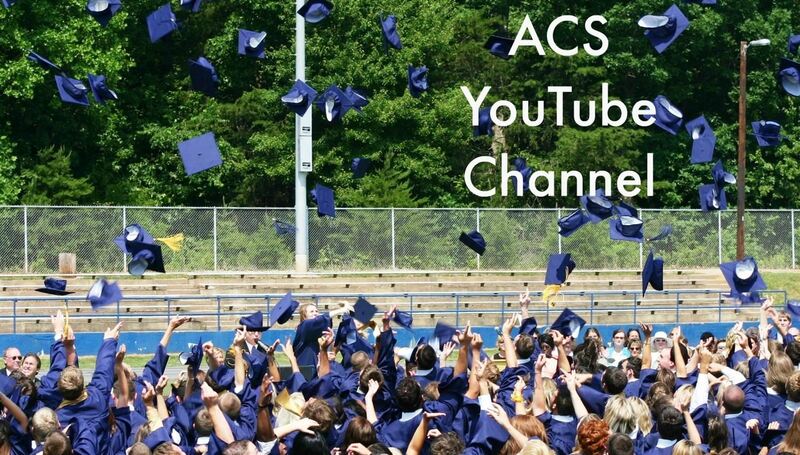 The winning designs will be used as the official ACS Holiday Card. The card will be mailed or sent electronically to friends and associates of the school system. Up to four winners will be chosen. 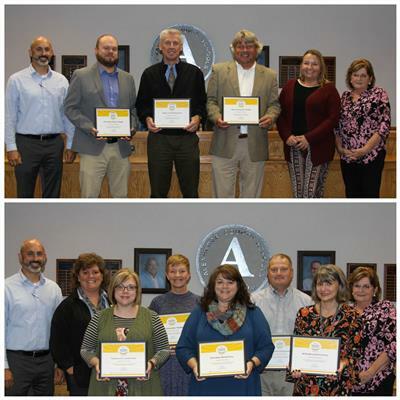 Alexander County Public Education Foundation President Brigette Rhyne recognized foundation board members and selection committee members for their work with the foundation. 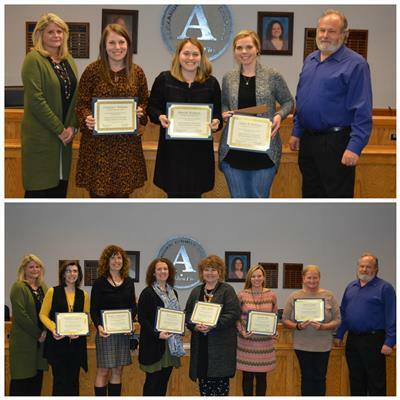 Rhyne presented six grant awards to staff members in Alexander County schools. Click the title to read the full article. 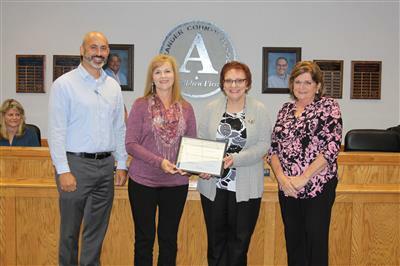 Alexander County Schools Finance Department was awarded the North Carolina State Board of Education and the North Carolina Department of Public Instruction Excellence in Management of the North Carolina State Public School Fund. Accepting the award on behalf of the finance department were Chief Finance Director Sharon Mehaffey and Financial Assistant Liz Bowman. 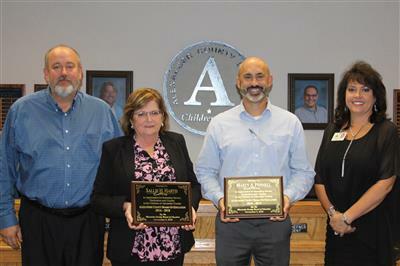 Two school board members whose terms expire this month were honored at a reception prior to the school board meeting and presented certificates during the meeting. Sallie Hartis and Marty Pennell served a term from 2014 to 2018 as school board members. Hartis represented Taylorsville district 2. 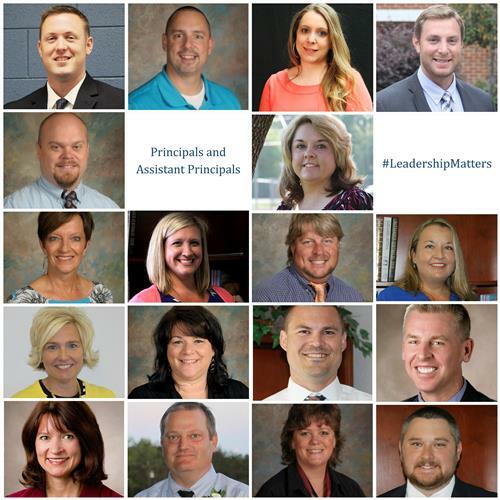 Pennell represented Sharpes, Millers, Sugar Loaf, and Gwaltney district 4. Join Us at the Taylorsville Apple Festival! Students - remember the first student to catch-up with your principal wins! All proceeds above costs go to the Needy Children's Benevolence Fund for the schools. Principals have an incredibly demanding job in K-12 education. They are leaders in their schools and communities. They must build and maintain relationships with their teachers, students, parents, and district administration in addition to guiding instruction, providing a safe environment, and closing achievement gaps. In an effort to honor the principals and assistant principals in Alexander County, district administrators hosted a lunch after the monthly administrators meeting on Tuesday, October 16. Please join us in recognizing the outstanding work of principals in shaping our schools and communities. Thank a principal and assistant principal today! 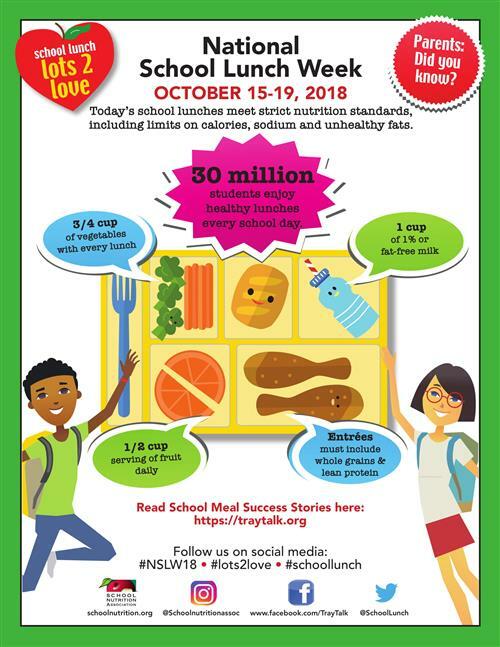 Celebrate National School Lunch Week With Us! October is National Bullying Prevention Month. Alexander County Schools’ goal is to raise awareness and provide bullying prevention tips through a social media campaign on each Wednesday during the month. Read the full article and watch a video by clicking on the title. Alexander County school officials are alerting parents to use multiple communication sources for weather-related information over the next few days. Although the school system uses the automated call system to alert parents of school delays, dismissals, and cancellations, please plan to use alternate sources in the event the call system is overloaded or information has not been updated. “Parents should plan to use all sources of communication available which includes the district website, school social media sites, the Taylorsville Times Breaking News, and WACB AM 860 radio station. The likelihood that all surrounding school systems will also be making calls during the same timeframe is extremely high. We do not want parents to depend on the call as the only source of information in an emergency situation,” according to school officials. “Many students have not returned the data forms to the schools and the larger schools have not had time to process all of the information into the system.” The school system administration will maintain close contact with emergency management to determine any changes in the school schedule due to weather-related events. 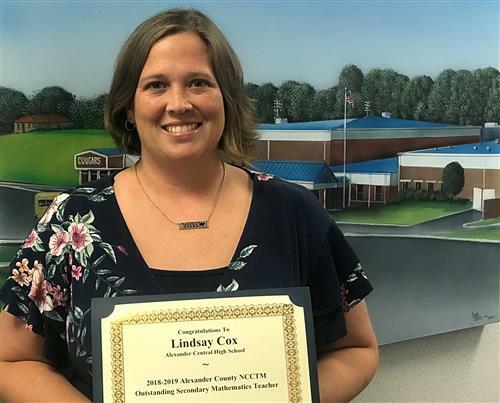 Ms. Lindsay Cox, Alexander Central High School teacher, was recognized by the Alexander County Board of Education as the 2017-2018 Secondary Mathematics Teacher of the Year for Alexander County. The North Carolina Council of Teachers of Mathematics (NCCTM) and the North Carolina Department of Public Instruction (NCDPI) recognize and reward secondary school teachers who exemplify mathematics teaching excellence by nurturing students' enthusiasm for mathematics through everyday classroom experiences. This recognition is for teachers who succeed in motivating students to excel in mathematics. Ms. Cox has taught in Alexander County for fifteen years, all at Alexander Central. She is a graduate of Appalachian State University with a bachelor’s and a master’s degree in Secondary Mathematics Education. 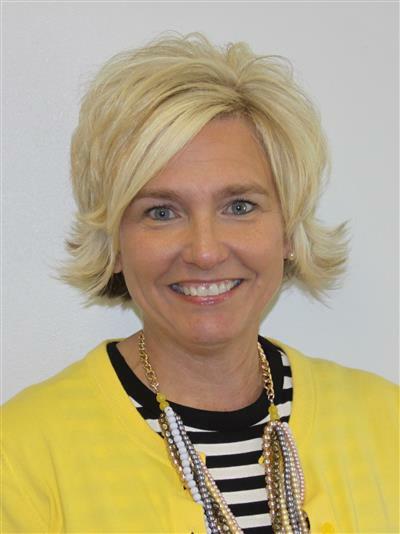 Daigle Named Assistant Principal East Alexander Middle School welcomed Amy Daigle as the new assistant principal as the 2018-2019 school year began. Daigle is a former science teacher and sales/marketing specialist. For nine years, Daigle taught science at St. Stephens High School. Over those years, she served as the science department chairperson, building leadership team member, professional development designer/facilitator, county-wide curriculum trainer, and head coach for Science Olympiad along with her teaching responsibilities. She has also served as a content area specialist for Lenoir-Rhyne University. Prior to Daigle’s experience in Catawba County Schools, she served as a sales and marketing specialist for Greer Laboratories in Lenoir. She has a master’s degree in School Administration from the University of North Carolina at Wilmington and a bachelor degree in Pre-Professional Biology with a minor in chemistry from Appalachian State University. Daigle and her family, husband, Jason, and sons, Aiden and Ryley, reside in the Bethlehem Community. 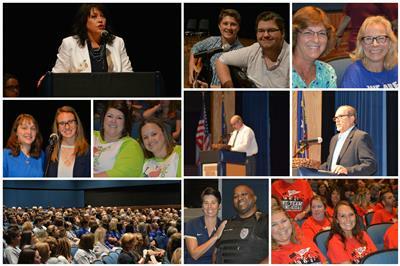 Approximately 650 school system faculty, staff, and administrators gathered at Alexander Central Auditorium for the 2018-2019 Opening Session for Alexander County Schools on August 21. Click the title to read more. 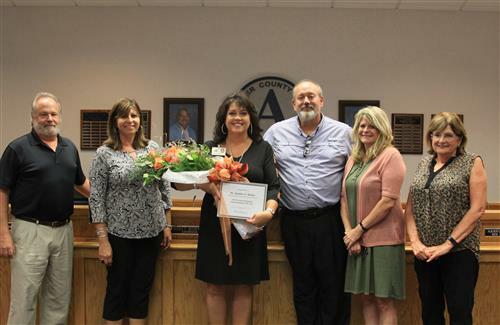 Susan Gantt, Career and Technical Education (CTE) Director of Alexander County Schools in Taylorsville, North Carolina, has recently been named the Northwest Regional CTE Administrator of the Year through the North Carolina Association of Career and Technical Education (NCACTE). Gantt is one of six regional winners in North Carolina. This honor places her in the running for State CTE Administrator of the Year. The winner will be announced at the spring conference in February 2019. Since 2012, Gantt has served as the CTE Director. Prior to this position, she taught agriculture for one year in Kings Mountain, and then six years at Alexander Central High School. She served as assistant principal at West Junior High for two years, and then as the principal at West Alexander Middle School for twelve years. She has both a bachelor’s degree and master’s degree from North Carolina State University in Agriculture Education. Gantt also earned her principal certification and Educational Specialist Degree from Appalachian State University. Gantt and her husband, Kevin reside in Hickory and have three children, Layton, Lauren, and Elliott. As of next week, her two oldest children will be attending NC State University. Alexander Central High School Men’s Basketball Coach Ed Wills was recognized on August 14, 2018, by the Alexander County School Administration and Board of Education for the 2018 Coaches vs. Cancer Coach of the Year Award. Coach Wills was recognized by the North Carolina Basketball Coaches Association as Coach of the Year at their annual meeting in Greensboro in July. “I have a great deal of respect for Ed Wills, on and off the basketball court. He challenges his students to perform at a high level just like he challenges his basketball players,” stated Superintendent Dr. Jennifer Hefner. “He holds himself, his students and his student athletes to a high standard and I truly appreciate that he understands the importance of both of the roles he plays at Alexander Central.” The Coaches vs. Cancer program was developed to support the American Cancer Society in their efforts in fighting cancer. Fans pledge a dollar amount for every 3-point shot made by the team during the season. School Open House Dates - Alexander Central High School will hold open house for all students on Tuesday, August 21 from 3:00 PM to 6:00 PM. Freshman Academy will host open house during the same time as the high school. Freshmen will meet with seminar teachers beginning at 5:30 PM. East & West Middle Schools will hold open house on Thursday, August 23 from 6:00 PM to 8:00 PM. Jump Start for 6th Grade will be held on the following dates. WAMS – Wednesday, August 22 from 12:30 PM to 4:00 PM with a parent meeting at 4:00 PM EAMS – Thursday, August 23 from 12:30 PM to 4:00 PM with a parent meeting at 4:00 PM All elementary schools including Head Start and NC Pre-K will hold open house on Thursday, August 23 from 4:30 PM to 6:30 PM. Parents are encouraged to attend. 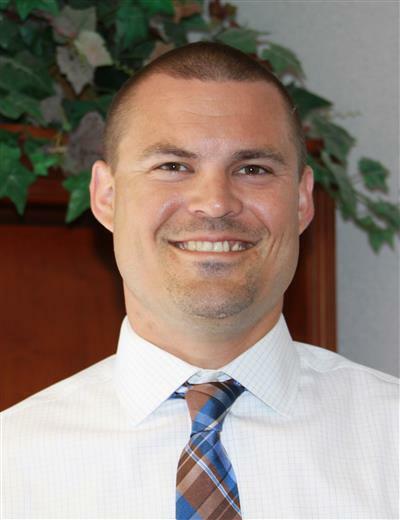 Joseph Mabry was named the assistant principal for the split position shared between Bethlehem and Hiddenite Elementary Schools. He has served as a middle grades teacher in math and social studies. He has a bachelor’s degree in middle grades education from Appalachian State University and is currently pursuing a master’s in school administration. Mabry and his wife, Harley, live in the Sugar Loaf Community. 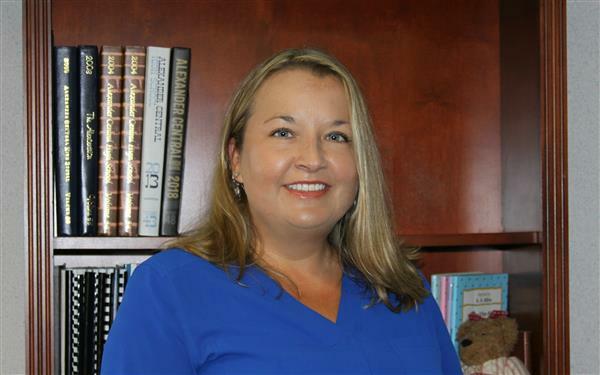 Jamie Curtis was named as assistant principal for West Alexander Middle School. She has served as the instructional coach at the school since January of 2017. She also taught eighth grade with national board certification. Curtis has a bachelor’s degree from the University of North Carolina at Greensboro and master’s degree from the University of North Carolina at Charlotte. She is currently working on her graduate certificate in school leadership from Appalachian State University. Curtis and her husband Jason live in the Bethlehem Community with daughter Jaden, son Jake, son Jamison. 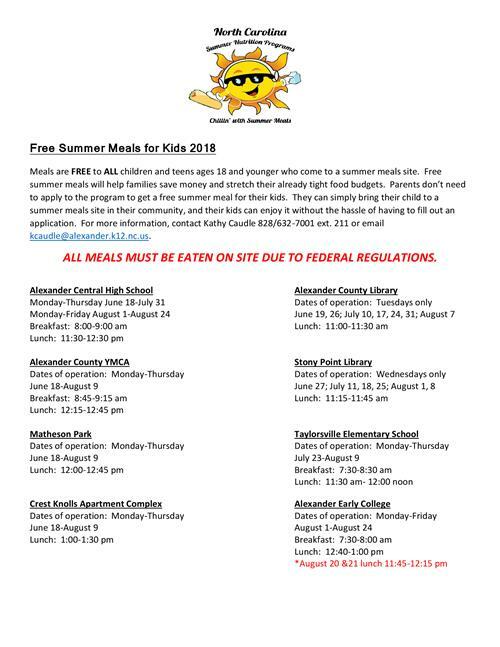 Check out the additional locations and times for free summer meals. 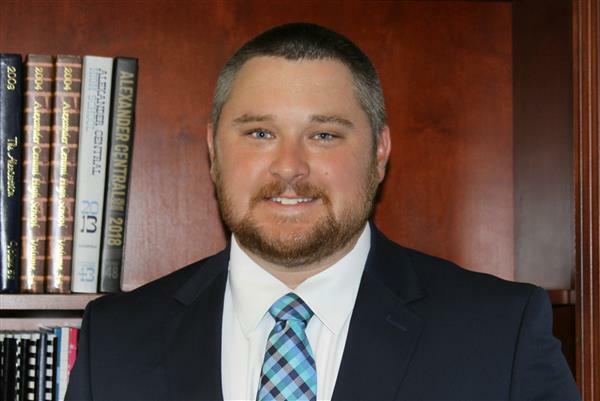 The Alexander County School Board of Education named Gordon Palmer as principal of Alexander Central High School effective July 1, 2018. “I am excited to work with the great students, staff, and community of Alexander Central,” stated Palmer. “There is a tradition of excellence and high standards that I look forward to maintaining and growing.” Palmer has served as the principal of West Iredell High School since 2013 and was the assistant principal for two years before that. He taught history and coached at Statesville High School for approximately five years. Palmer also has administrative and teaching experience earlier in his career in New York. Palmer created an AP Academy at West Iredell High School and grew it from eighteen students to over two hundred in three years. The school has also doubled in teacher effectiveness during his tenure. “It's hard to leave West Iredell High School because our team has accomplished so much together, but I'm ready to lead the great staff at Alexander Central High School,” stated Palmer. Palmer received a bachelor’s degree in history from the University at Albany and his master’s degree in teaching from Sage Graduate School. He completed his executive leadership in administration at Gardner Webb University. Palmer and his wife, Molly, have a son, Jackson, 5, and a daughter, Reese, 2. Charmion Frizsell was named principal of Bethlehem Elementary School effective July 1. Frizsell has served as the Exceptional Children Compliance Officer/Preschool Coordinator since 2016. She served as the principal at Gamewell Elementary School in Caldwell County from 2010 – 2016. She has also served as an assistant principal, instructional facilitator, and a teacher in Burke and Caldwell Counties. Frizsell holds a bachelor’s degree in elementary education from Lenoir Rhyne University and a master’s in school administration from Appalachian State University. Frizsell and her husband, Todd, have five children. 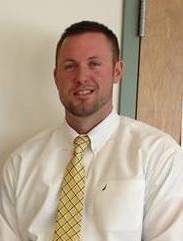 Charles Draper was named principal of Hiddenite Elementary School effective July 1. 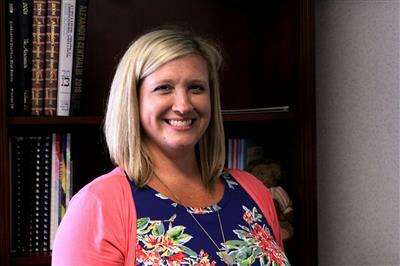 Draper has served as the assistant principal of Bethlehem Elementary and Hiddenite Elementary since early 2018. In 2016, he was named the assistant principal at West Alexander Middle School. He holds a bachelor’s degree from Appalachian State University in special education and a master’s degree in executive leadership from Gardner Webb University. Draper taught special education at Newton Conover Middle School. He has worked with students in South Africa and Cambodia. Draper and his wife, Betsy, have two children.